Can always help of search engine Google to get answers to any question, but Mai PEOPLE is introduced by Google sites may contain answers to the question posed by the user. To save time, so users can experience http://www.quickanswers.io site that offers specialized search engine responses, Vamahrk shall be subjected to the user sites that may contain the answers, but displays the answer directly with the source, if a user wishes to be informed in detail. 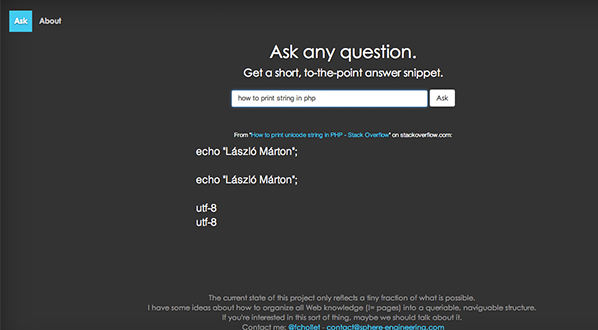 After logging into the site, the user types his question directly in the space provided and clicking on the button Ask are searched and displayed a tidy answers under each other.